Devon, PA. 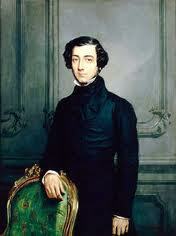 I have just finished teaching Alexis de Tocqueville’s Democracy in America with my freshmen students. In a way I have not witnessed before, they were compelled by his account of American culture and society, and they saw in his words what so many before them have: a prophetic element that commands attention. We concluded our study with a discussion of the following choice paragraphs from the concluding pages of the book. Their prescience strikes me as so great, that I thought I would share them with our readers to provide grist for reflection. Accounts of Tocqueville vary, so, in preface, let me provide an abstract of my own. Tocqueville came to America, having witnessed the combined success and failure of democratic revolutions in France and much of Europe. The revolutions had succeeded in shaking the established order of absolute monarchy and a residual aristocratic culture (these were distinct, independent features of European society), and they had succeeded in establishing a principle of equality that made any reversion to the old order seem impossible, and the continued spread of equality into every aspect of human life to seem inevitable. Because of this successful demolishment and establishment, modern Europe seemed plagued by uncertainty and listless regarding its fortunes. A belief in equality had ripped old customs and creeds from the people’s hearts, but it had neither provided new substance to replace the old nor a clear suggestion as to how equal social conditions could lead to a flourishing society. Tocqueville saw that America was in many respects an egalitarian society, but it had experienced neither the trauma of cultural or social revolution nor the wrenching psychological and philosophical transformations of one. To the extent that American society worked, how did it work? What were the elements that allowed it to appear so dynamic and humming, while the new states of Europe swayed moribund, back-and-forth between the old order and the new? Equality seemed the inevitable course of history, observed Tocqueville. Indeed, the one certainly that seemed in place prior to the writing of Democracy, and which informs the shape of the book, is that the ever-increasing spread of equality into every precinct of human life was fated. Whatever goods might come with the spread of equality, its chief evil was the implanting of “individualism” in the heart of man. The individualist looks out on the spectacle of his fellow citizens and concludes that he has no stake or part in that undifferentiated mass. All men are equal, so let each man contend for himself. He consequently turns inward, not on himself alone, but on a select group of his nearest family relations and a few friends; these are his only society, because such relations are the only ones that continue to appear natural and meaningful. Because citizens in democratic countries are weak and, to the extent they are weak, unfree, the spirit of individualism makes such citizens ripe for despotism. Indeed, jealous of their equality and largely unattached to those with whom they share it, they will tend to give up their particular liberties to a centralized state. If they cannot be wholly equal and wholly free, they would rather be equal in slavery. If they cannot rule themselves, they will suffer nothing but the State to do so. Americans, from the earliest days of New England society, had cherished equality while avoiding the grave evil of individualism. Tocqueville’s account of how they did so may be his most famous set of observations. First of all, Americans embrace with cool practicality and warm affection the life of the nuclear family; the small family consisting of only parents and children was a novelity in the Nineteenth Century, but Americans had made it an efficiently functioning unit that held together chiefly through affective bonds and which trained children for adulthood early — for hard work and careful decision making. American girls were more jaded and cautious than their naive but romantic European counterparts; American boys were enterprising industrialists with a keen sense of the flux of social and economic fortunes almost from the time they left grade school. The nuclear family does not specifically counter the effects of individualism, but rather accepts them and finds a familial form that can survive the great ebb and flow of economic fortunes absent the stability of land and broader social attachments to neighborhood, village, and province. Four other American practices more directly counter the evil of individualism. Second, the primacy of local or township government in American society made it possible for a great number of Americans to participate in political institutions on a regular basis. Whether as Fire Chief or head of the St. John’s Mint Festival, whether as Dog Catcher or Mayor, Americans were continually forced to turn away from themselves and to attend to the life and business of their neighbor. The long habit of such participation in public life convinced Americans that, despite their equality, they need not and could not be indifferent to the particulars of social life. This also preserved Americans from the tendency to invest their political beliefs in a few general ideas. Accustomed to the details of daily participation in political life, they did not let what is often called (wrongly, I think) “ideology” substitute for active engagement in the public realm. This was possible chiefly because the actions of political life were largely confined to the local level, even when the legislation directing that life occured far away. Third, Americans formed and joined public associations outside of political parties with avidity. A foreign student of mine sees this present even now, but Robert Putnam and others have shown that, however much Americans love to join groups now, they did so much more frequently in the past. All public life and, indeed, all potentially “private” moral decisions found expression in some association or another. As Tocqueville observed, teetotallers in America did not simply sit at home and drink water, nor did they (as in France) apply to the prefect to keep an eye on the taverns. Rather, they joined a Temperance Union and marched through the streets of East Lansing — no doubt, on their way to a pancake breakfast to raise funds for future such marches. Fourth — perhaps anti-climactically — Tocqueville observes the utilitarian spirit of American moral life. If one can show that participation in social life actually advances one’s self-interest, then Americans will take to public life with pride and enthusiasm. They will even do so, all the while insisting that their service to the common good is understaken entirely for “selfish” reasons. Lacking a vision of ethics as the pursuit of the Good, Tocqueville is bit wary and even at a loss before this aspect of American life, but he sees it as a moral code well adapted to an age of equality. “Self-interest rightly understood” teaches us that, in order to serve our own good, we must secure the good of others. Even the convinced individualist can see that to advance his family’s interests, he must participate in a great number of public groups and actions — individuals in an egalitarian society are, after all, particularly weak when isolated. Over the course of writing his brilliant account of American society, Tocqueville seems to have discovered something: the one preconceived certitude with which he approached his subject — the inevitability of equality — was his one definite error. As he would explore more fully in his later writings, the timeline of history, with its undeviating arrow, did not point toward the spread of equality per se. Rather, if one took a longer view than that of the recent European revolutions, or even than that of the founding of the American colonies, the trajectory of history seemed aimed at a different, not to say incompatible, end. Centralization. The state has everywhere reclaimed for itself alone those features which naturally belong to the sovereign power; in everything connected with government, the state does not tolerate anything standing between citizens and itself and it controls all matters of general concern itself. Far from criticizing this concentration of powers, I merely point it out. Years ago, almost all the charitable institutions were in the hands of individuals or corporations; they have almost all become dependent on the government and, in several countries, are administered by that power. The state has undertaken almost exclusively to provide the hungry with bread, the sick with help and shelter, and the idle with work; it has become almost the sole relief against every misery . . . [one] perceive[s] that, over the last fifty years, centralization has increased everywhere and in a thousand different ways. Wars, revolutions, and conquests have promoted its progress; every person has worked to increase it. In this same period, when men, at a tremendous rate, have followed each other at the head of affairs, their ideas, interests, and passions have shown infinite variety; yet all have wished to centralize in one way or another. The instinct to centralize has been virtually the only stable feature amid the general instability of their lives and thoughts. Centuries past never witnessed any ruler so absolute or powerful as to undertake the administration, on his own and without the support of secondary powers, of every part of a great empire; nor did anyone try to subject all his people indiscriminately to the details of a uniform code of conduct; nor did anyone descend to the level of every common citizen in order to rule and direct him. I wish to imagine under what new features despotism might appear in the world: I see an innumerable crowd of men, all alike and equal, turned in upon themselves in a restless search for those petty, vulgar pleasures with which they fill their souls. Each of them, living apart, is almost unaware of the destiny of all the rest. His children and personal friends are for him the whole of the human race; as for the remainder of his fellow citizens, he stands alongside them but does not see them; he touches them without feeling them; he exists only in himself and for himself; if he still retains his family circle, at any rate he may be said to have lost his country . . . Above these men stands an immense and protective power which alone is responsible for looking after their enjoyments and watching over their destiny. It is absolute, meticulous, ordered, provident, and kindly disposed. It would be like a fatherly authority, if, fatherlike, its aims were to prepare men for manhood, but it seeks only to keep them in perpetual childhood; it prefers its citizens to enjoy themselves provided they have only enjoyment in mind. It works readily for their happiness but it wishes to be the only provider and judge of it. It provides their security, anticipates and guarantees their needs, supplies their pleasures, directs their principal concerns, manages their industry, regulates their estates, divides their inheritances. Why can it not remove them entirely from the bother of thinking and the troubles of life? . . . Thus, it reduces daily the value and frequency of the exercise of free choice; it restricts the activity of free will within a narrower range and gradually removes autonomy itself from each citizen. Equality has prepared men for all this, inclining them to tolerate all things things and often even to see them as a blessing. Readers have likely seen more than enough of my work to know what I think of these observations. If Tocqueville’s conception of society is sometimes inadequate because his terms of evaluation — liberty and equality — do not help us answer questions about the good of the human person or the Good that is the end of all things and of the universal order, he nonetheless harnessed great resources to see into the heart of the “modern problem.” I would be curious to hear what readers think of his evaluation. I heard John Boehner on the news this morning, telling us all that there is a fundamental ideological difference between President Obama and himself on the scope and size of government. So far as I can tell, however, that seems to mean that Republicans would like America to be roughly 2% less centralized than would our feckless leader. Thank you for some very stimulating reflection. I think you are right that equality has not been realized in the sense of equal ability, equal access to political power, equal economic opportunity or means, equal access to education, etc. (all the important things). However, I do think in a very important way we are all equal; that is in our collective consciousness. We are only allowed to use the language of equality to make moral points and political arguments. We live, as Jacques Barzun would say, in “demotic times”, where the incessant cant of equality that Tocqueville worried about has come to dominate our cultural consciousness. We are hamstrung in making judgments about what is proper behavior, what is good art and literature, what will or will not be good for the nation because in making these judgments we are not allowed to leave anyone out or offend. We are all equal. On a positive note, demotic consciousness provides a language to keep the most egregious tyranny in check. However, it is really sad that even though demotic culture and consciousness is at a fever pitch, true equality (political power, economic justice, educational opportunity, stable families as a norm for most children) is so far from a reality and is in fact on the decline. My hunch is that at times the wealthy and powerful superbly manipulate demotic consciousness for their own ends. The rest of the time demotic consciousness serves up a smorgasbord of cultural distractions that keep the mind thoroughly distracted from the important questions related to true and thoroughgoing equality. Thanks for these thoughts. This will be my only reply to comments, and I make it specifically to encourage other readers to write in and share their thoughts; I had originally meant just to include the quotation and invite reflections and responses, but then I thought it would be worth setting out Tocqueville’s major insights for those who do not know them. Per your specific remarks, I intended my title as a bit of a pun, i.e. the end, as in the telos, of equality is tyranny. “Equal freedom,” as James Kalb aptly calls it. Barzun seems an interesting and appropriate thinker to bring to the table here; he certainly reflects Tocqueville’s observations in other sections of Democracy. In another of his uncanny snapshots of the future, he nails it, and us. Pardon the throw from out of left field, but I think one of the most fascinating evenings that might have ever been, though an impossible ‘Meeting of the minds’, would have been gathering around the fire with de Tocqueville, Irving Babbitt and George Orwell. The flames might have grown jealous. “All men are equal, so let each man contend for himself.” is one way that many of us choose to act out the idea of equality. That describes a state of intellectual, moral and spiritual failure. I would say to Tocqueville that Western individualism, rather than a grave evil, is founded upon the Gospels – one way I read them is as a frontal assault upon the tribalism of the Old Testament. The most important thing, at one time the only thing that mattered, salvation, became an individual attainment. It matters no longer that I am not a member of a particular tribe – someone who’s religious heritage consists of oak trees, druids and blood sacrifice is quite welcome in the folds of the Church. The individualism is tempered with specific parables and sermons on the expected behavior for members of a society. The prescriptions – some, such as what’s found in the Good Samaritan, so well known they approach being cliches – are unfortunately easily rationalized away. Whether it’s Adam Smith stripped of moral sentiments or Christian individualism stripped of charity and humility, denuded individualism is seemingly always vulgar. So, I do not see anything in the idea of equality that would necessarily lead to a life devoted to the search for petty and vulgar pleasures. I can only conclude that our aim is off. An egalitarian society requires of it’s members a particular definition of personal success, of meaning and purpose. Our failure, for a long time now, and despite being given some fairly explicit instruction by both Stoics and Saints, has been to adopt incorrect definitions. It’s upon hedonism, not equality, where I place the laurel of tyranny. From that little point of divergence, this is where I end up. I’m reminded of Fibber McGee, who was very much an old-fashioned American trying to survive in modern times. He was part of all sorts of lodges and clubs, and when he got excited about something his first impulse was to hold a meeting about it. The more modern characters saw Fibber as a loafer. This is simply great stuff (I reposted this at my own blog: http://www.thereformedmind.wordpress.com). It is amazing to me how the same tired ‘remedies’ to our social problems are marched out by the left (more government ‘help’) and right (lower taxes and more individual freedom), with no interest in the root causes. I often say to my own students, if modern liberals were really really concerned with the plight of the poor, the welfare of children, the health care of the sick, they would be the greatest defenders of the traditional family. Instead, they think a meal provided by government is the equivalent of a meal provided by parents or churches. A breathtaking and unfortunate misrepresentation of Individualism indeed. There is no doubt that I am no equal to a thinker of so great a height, and yet to slander individualism in such a way? Perhaps I’ve misunderstood. “Individualism” is an evil equal to that of state tyranny? It’s false even at first glance unless one’s goal is solely the maintanance of a particular State. There is the “individualism” of atomization and then there is the “individualism” which cannot exist without a strong umbilical connecting it to the health of the society within which it exists. Unfortunately, in this overtly atomic age, we seem to have selected the resentful pole of individualism and salved this disquiet with consumerism. Just as Religion has been the standard-bearer of both Intellectualism and anti-Intellectualism in American history, so too has “Liberty” played an ironic game of both narcissism and egalitarian compassion in our lives. Tocqueville and Crevecoeur witnessed the American Frontier Culture and clearly saw deeply into both its strengths and weaknesses, the irony that would dog us into our post-frontier confusion. Clearly, lacking an immediate frontier now, we slide deeper into the moribund pole of individualism, preferring distraction and sensation….what Tocqueville described as our lust for physicality and movement at the expense of introspection and as a result, liberty, aka “individualism” will slip through our hands to be replaced by “choice” from a set of shibboleths activated by the remote we use to placate our impatience. The most effective slander against a healthy individualism is commonly some program of deracinated “equal rights” whose principle outcome is a kind of State mandated leveling and steady impoverishment . Our Declaratory form of government, replacing the deceased Deliberative form of government is Exhibit One in this black comic state of affairs. Individualism is a lost art in this country now, residing in a little glass box with a sign stating “Break Only In Emergency”. The Lemming wears a sports jersey and calls it free will.